Luis Suarez capped a superb individual display with a late winner as Liverpool came from behind to beat Stoke in the Carling Cup fourth round. The hosts went ahead just before the break when Kenwyne Jones headed a low cross from Jon Walters into the corner. Liverpool hit back when Suarez nutmegged Ryan Shotton and curled a stunning strike past Thomas Sorensen. And four minutes from time, Jordan Henderson volleyed a cross to the far post where Suarez headed home. Liverpool then withstood a late onslaught to reach the last eight for the first time in four seasons and exact revenge for their 1-0 league loss to Stoke in September. For the hosts, who had a Walters goal harshly ruled out in the first half, defeat at least enables them to focus their attention on the league and on continuing their impressive progress in Europe. After a relatively even opening, in which Walters and Carroll both went close from long range, the Reds took control of the first half and almost went in front through Suarez. Lucas played a one-two with Maxi Rodriguez and squared the ball for the striker, whose shot from point-blank range was smothered by Sorensen. A fortunate deflection then fell at the feet of Carroll, but his shot with his weaker right foot was straight at the Stoke goalkeeper. Stoke thought they had taken the lead against the run of play when Walters headed a Rory Delap long throw into the net only for referee Lee Probert to disallow the goal for a push on goalkeeper Pepe Reina. Any sense of grievance was short-lived as Stoke took the lead following a sloppy error from Liverpool centre-back Sebastian Coates. The Uruguayan's mis-hit clearance enabled Walters to escape down the right wing and send over a low cross for Jones to glance a header into the far corner. Shortly afterwards, Suarez wriggled into the box and stayed on his feet under a challenge from Ryan Shawcross before dragging a shot well wide. 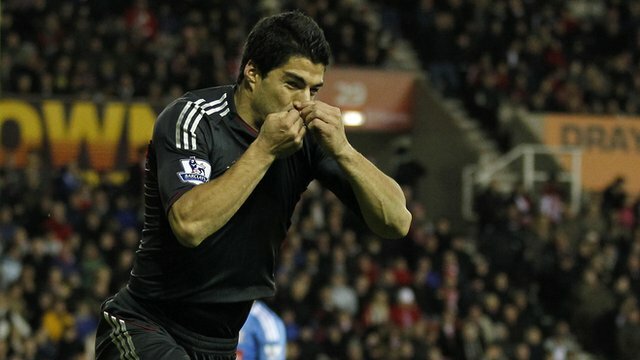 Stoke began the second half on the front foot but were undone by a moment of magic from Suarez. Picking up the ball on the left, he skipped past Shotton, advanced into the area and whipped an unstoppable shot just inside the far post. With the game drifting towards extra-time, Reds boss Kenny Dalglish introduced Craig Bellamy and the Welsh striker was soon into the thick of the action, exchanging passes with the disappointing Carroll before hitting the post from the edge of the box. Liverpool's winner arrived moments later when a headed clearance fell to Henderson just outside the box. The midfielder's first-time cross picked out the unmarked Suarez at the far post and the Uruguayan planted a header across Sorensen. Suarez hobbled off soon afterwards with a calf problem and watched from the sidelines as some desperate defending prevented Stoke from taking the game into extra-time. 90:00+4:50 The referee blows for the end of the match. 90:00+2:59 Robert Huth gives away a free kick for an unfair challenge on Daniel Agger. Jose Reina takes the free kick. 90:00+0:41 Dirk Kuyt gives away a free kick for an unfair challenge on Marc Wilson. Thomas Sorensen restarts play with the free kick. 89:46 Free kick taken by Jose Reina. 89:46 Booking The referee cautions Robert Huth for unsporting behaviour. 89:43 The assistant referee signals for offside against Peter Crouch. 88:52 Inswinging corner taken right-footed by Jermaine Pennant, save made by Jose Reina. Correction - 87:34 Substitution Dirk Kuyt on for Luis Suarez. 87:34 Substitution Dirk Kuyt joins the action as a substitute, replacing Luis Suarez. 87:09 Substitution Peter Crouch on for Kenwyne Jones. 84:51 Assist on the goal came from Jordan Henderson. 84:51 GOAL - Luis Suarez:Stoke 1 - 2 Liverpool Luis Suarez finds the net with a headed goal from close range. Stoke 1-2 Liverpool. 84:28 The assistant referee signals for offside against Kenwyne Jones. Jose Reina restarts play with the free kick. 83:39 Craig Bellamy has an effort at goal from just outside the box that bounces off the post. 82:30 Shot by Marc Wilson missed to the right of the net. 81:03 Thomas Sorensen restarts play with the free kick. 81:03 Substitution Craig Bellamy on for Rodriguez Maxi. 81:03 Luis Suarez is ruled offside. 79:55 The ball is delivered by Jermaine Pennant. 74:46 Foul by Glenn Whelan on Jay Spearing, free kick awarded. Free kick crossed right-footed by Jordan Henderson from right channel, clearance made by Kenwyne Jones. 69:18 The assistant referee flags for offside against Luis Suarez. Free kick taken by Thomas Sorensen. 67:37 Corner taken right-footed by Jordan Henderson from the right by-line, clearance made by Robert Huth. 64:10 The ball is delivered by Jermaine Pennant. 63:32 Substitution Cameron Jerome comes on in place of Matthew Etherington. 61:49 Jermaine Pennant delivers the ball, Sebastian Coates makes a clearance. 59:22 Substitution (Stoke) makes a substitution, with Jermaine Pennant coming on for Ryan Shotton. 57:01 Corner taken by Jordan Henderson from the right by-line to the near post, Ryan Shotton manages to make a clearance. 56:23 Foul by Jonathan Walters on Leiva Lucas, free kick awarded. Direct free kick taken by Jose Reina. 55:20 Booking Glenn Whelan shown a yellow card. Correction - 53:03 GOAL - Luis Suarez:Stoke 1 - 1 Liverpool Luis Suarez fires in a goal from just outside the penalty area to the bottom right corner of the goal. Stoke 1-1 Liverpool. 53:03 Leiva Lucas provided the assist for the goal. 53:03 GOAL - Luis Suarez:Stoke 1 - 1 Liverpool Luis Suarez grabs a goal from just outside the area to the bottom right corner of the goal. Stoke 1-1 Liverpool. 51:56 Foul by Leiva Lucas on Jonathan Walters, free kick awarded. Glenn Whelan restarts play with the free kick. 48:19 The referee blows for offside. Indirect free kick taken by Thomas Sorensen. 48:04 Matthew Etherington sends in a cross, clearance by Sebastian Coates. 45:33 The assistant referee signals for offside against Luis Suarez. Thomas Sorensen takes the indirect free kick. 45:01 Substitution Martin Skrtel is brought on as a substitute for Jamie Carragher. 45:00+2:16 It is the end of the first-half. 45:00+1:01 Shot by Luis Suarez from deep inside the penalty area misses to the left of the goal. 43:02 Assist by Jonathan Walters. 43:02 GOAL - Kenwyne Jones:Stoke 1 - 0 Liverpool Kenwyne Jones finds the back of the net with a headed goal from inside the penalty box. Stoke 1-0 Liverpool. 40:32 Jordan Henderson takes the free kick. 40:32 Booking Booking for Ryan Shawcross. 40:26 Unfair challenge on Luis Suarez by Ryan Shawcross results in a free kick. 38:01 Corner taken by Matthew Etherington played to the near post, Sebastian Coates makes a clearance. 37:49 Ryan Shotton delivers the ball, save by Jose Reina. 37:12 Martin Kelly takes a shot. Thomas Sorensen makes a save. 36:26 Rory Delap delivers the ball, Jamie Carragher makes a clearance. 34:53 Free kick awarded for an unfair challenge on Jose Reina by Ryan Shawcross. Jose Reina restarts play with the free kick. 31:56 Free kick awarded for a foul by Ryan Shotton on Daniel Agger. Jordan Henderson delivers the ball from the free kick right-footed from left wing, clearance made by Kenwyne Jones. 28:55 Matthew Etherington sends in a cross. 27:41 Corner taken left-footed by Matthew Etherington, Close range headed effort by Robert Huth goes wide of the left-hand post. 26:26 Jonathan Woodgate challenges Luis Suarez unfairly and gives away a free kick. Free kick crossed right-footed by Jamie Carragher from right channel, save by Thomas Sorensen. 25:55 Andy Carroll takes a shot. Save made by Thomas Sorensen. 24:09 Robert Huth fouled by Daniel Agger, the ref awards a free kick. Thomas Sorensen restarts play with the free kick. 22:48 Daniel Agger fouled by Ryan Shotton, the ref awards a free kick. Jose Reina restarts play with the free kick. 21:59 The referee blows for offside. Jose Reina takes the free kick. 20:28 Free kick taken by Glenn Whelan. 20:28 Booking Jamie Carragher booked. 20:19 Free kick awarded for an unfair challenge on Matthew Etherington by Jamie Carragher. 17:57 Andy Carroll fouled by Ryan Shawcross, the ref awards a free kick. Direct free kick taken by Leiva Lucas. 16:49 Inswinging corner taken by Jordan Henderson from the left by-line, Andy Carroll takes a shot. Save by Thomas Sorensen. 15:58 Luis Suarez takes a shot. Save made by Thomas Sorensen. 13:21 Luis Suarez delivers the ball, Jonathan Woodgate makes a clearance. 12:48 Luis Suarez takes the chance to get an effort at goal. Save by Thomas Sorensen. 9:50 The ball is delivered by Rory Delap, Jonathan Walters gives away a free kick for an unfair challenge on Jamie Carragher. Jose Reina restarts play with the free kick. 8:32 Andy Carroll takes a shot. Thomas Sorensen makes a save. Shot by Luis Suarez from deep inside the penalty area misses to the right of the target. 7:44 Effort by Jay Spearing from a long way out goes over the target. 6:50 Effort on goal by Jonathan Walters from outside the area goes harmlessly over the bar. 6:20 Luis Suarez is flagged offside by the assistant referee. Thomas Sorensen restarts play with the free kick. 4:59 Free kick awarded for an unfair challenge on Jay Spearing by Glenn Whelan. Free kick taken by Jamie Carragher. 4:25 The referee blows for offside. Thomas Sorensen restarts play with the free kick. 2:20 Inswinging corner taken right-footed by Jordan Henderson from the left by-line, Foul by Sebastian Coates on Robert Huth, free kick awarded. Free kick taken by Thomas Sorensen. 1:36 Inswinging corner taken from the left by-line by Jordan Henderson, Ryan Shawcross manages to make a clearance.